A massive two story, irregular-shaped, stucco building, irregular roof elevations. Gabled shingled roof w/ some tile. Open galeria in middle section of second level. Predominately double-sashed windows, w/ metal and glass doors. 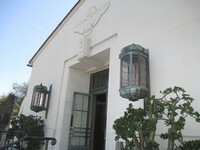 Essentially in the Spanish Colonial Revival style, the building contains many details of the Streamline Moderne style such as chevron decoration, stainless steel doors, and an eagle on the north façade. This combination of the old and the new links architecturally Santa Barbara's past and future. The six panels of interior relief sculpture are by William C. Atkinson. The building is attractively landscaped with hedges and trees. 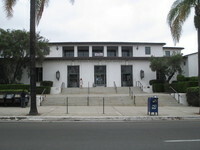 Designated City of Santa Barbara Landmark (07/18/1995). 6. 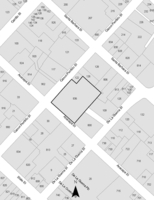 Its location on a prominent corner in downtown Santa Barbara and proximity to other buildings of historic significance representing an established and familiar visual feature of the neighborhood. The building was built on the site of an old chinese restaurant in China Town. Just before and after the turn of the century the site contained frame and adobe dwellings, and was known as a "red light district". 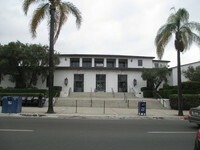 The post office is located immediately adjacent to the westerly façade of the Spanish Royal Presidio. A bronze plaque placed by the Native Sons of the Golden West on the building's entrance terrace commemorates this fact. Instead of building in its usual classical style, the U.S. government allowed the building to be built in the Spanish idiom. This was accomplished by the influence of Thomas Storke postmaster of Santa Barbara in 1914 and later to be editor of the Santa Barbara News-Press who traveled to Washington to plead the case for a Spanish style building. Its architect, Reginald Johnson, was one of the master architects who brought the Spanish Revival in Santa Barbara to national prominence. By the mid-1930's Johnson had shifted from pure Spanish imagery to streamline moderne and he let some of these streamline elements trickle into this otherwise Spanish building. Known for his ability to create each building to fit and harmonize with its site, his other works include the Biltmore Hotel and many elegant residences.